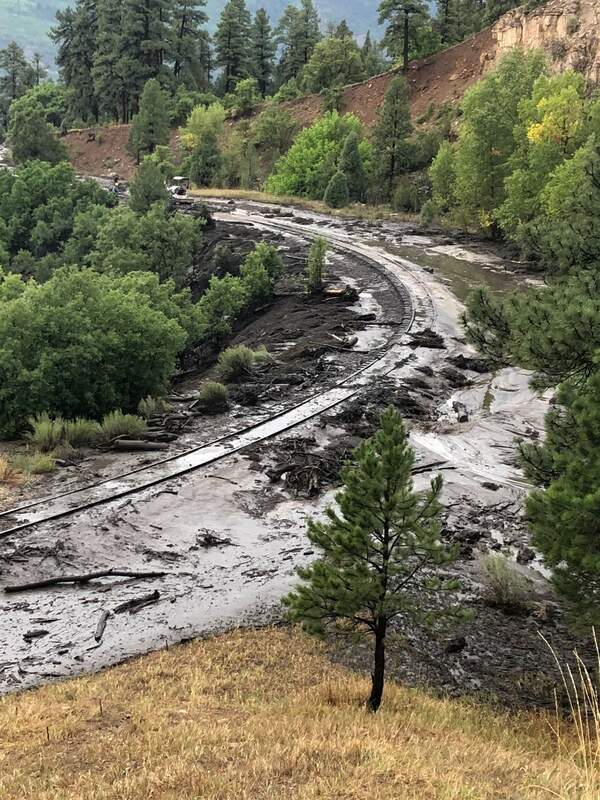 Floods and mudslides that emergency workers feared since rains started to hit the 416 Fire burn scar arrived Tuesday afternoon, with significant debris flows across U.S. Highway 550, railroad tracks and East Animas Road (County Road 250), north of Durango. 1 p.m.Lisa Schwantes, regional spokeswoman with the Colorado Department of Transportation reported that U.S. Highway 550 north of Durango was fully opened Wednesday morning. Crews are assessing any potential road or shoulder damage. A large amount of debris that came down in Tuesday’s flash flood and is still present on both sides of the highway. On Wednesday, crews will be working to clean the area, and commuters can expect roadside activity taking place for the remainder of the week. U.S. Highway 160, east of Pagosa Springs on Wolf Creek Pass, she said is also fully open, but the south side of the highway sustained slight shoulder damage. Crews will be cleaning up mud and debris, as well as repairing shoulder damage for the remainder of the week. Colorado Highway 151, about six miles south of U.S. Highway 160 junction at Lake Capote, is fully open. Maintenance crews on Wednesday are assessing any potential road or shoulder damage. A crew will be cleaning up excess debris along the sides of the road on Wednesday and Thursday, and she said work may extend into Friday. Schwantes cautioned commuters to slow down in areas where crews are clearing debris. Drivers can expect to encounter maintenance personnel and heavy equipment along the sides of the roadways for the next few days. Motorists can also expect short closures and delays while crews are working. And everyone should watch for flaggers and obey warning signs. 10 a.m.Campers who were staying at the KOA Campground and evacuated Tuesday night will be escorted to the campground to retrieve their belongings today. People should meet at the La Plata County Fairgrounds for an escorted shuttle. One camper per site can go, according to La Plata County. Some vehicles may not be movable. 8 a.m.As of 8 a.m. Wednesday, the Colorado Department of Transportation reported Highway 550 was confined to one-lane, alternating traffic between mile markers 80 and 92 because of rockslides. The mudslide caused the Durango & Silverton Narrow Gauge Railroad to cancel service today and Thursday. Service will resume Friday, July 20. Megan Graham, La Plata County spokeswoman, said East Animas Road and County Road 250C between Bakers Bridge and their intersections with Highway 550 is currently open to local traffic only. La Plata County has set up a hotline with information about the flooding and debris flow at 382-8700. Tuesday eveningThe flooding was first reported around 5:15 p.m. Tuesday as a strong rainstorm pelted the area. Though rain tapered off around 6 p.m., debris flows caused issues late into Tuesday evening. U.S. Highway 550 was closed near the East Animas Road intersection, which included the bridge at the base of Shalona Hill, where the Durango & Silverton Narrow Gauge Railroad passes underneath. The highway partially reopened to pilot-guided traffic about 8:45 p.m. 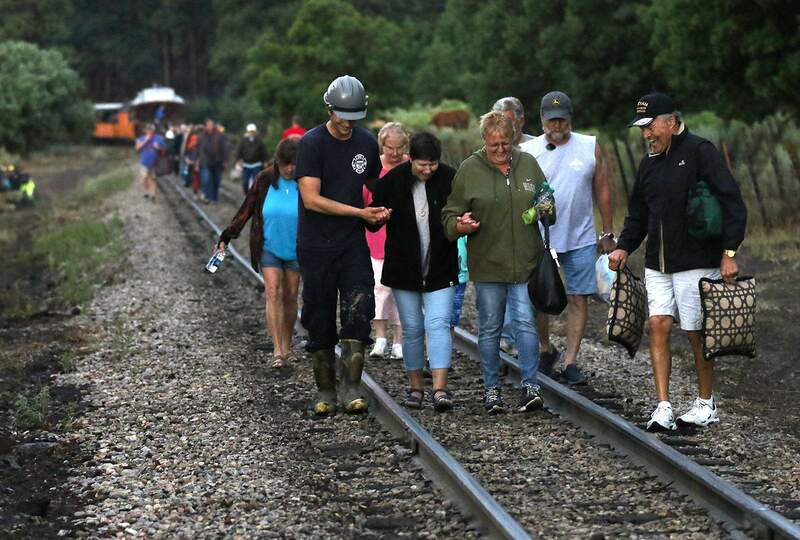 Passengers on the Durango & Silverton Narrow Gauge Railroad are escorted off the train to awaiting buses Tuesday evening after debris washed over the train tracks near the Shalona Hill bridge. A D&SNG train carrying about 400 passengers was blocked on the tracks near the Shalona Hill bridge, said Scot Davis, spokesman for Durango Fire Protection District. At about 7:20 p.m., three buses were en route from Durango to pick up the passengers, though more trips were likely needed. A KOA campground was evacuated near East Animas Road and U.S. Highway 550, one of the first places to report flooding. About 200 campers were bused to the La Plata Fairgrounds, where the Red Cross set up a shelter. No injuries were reported as of 8:30 p.m., and it’s unclear how much property damage may have occurred. Davis could not say how widespread the flood was or whether homes were damaged. The Hermosa area is on pre-evacuation notice because heavy rains in the upper portion of the watershed can take a while to reach homes, said Butch Knowlton, director of La Plata County Emergency Management. Firefighters were investigating two reported gas leaks: one at the KOA campground and one on East Animas Road. Davis said the leak at the KOA campground had been controlled. Knowlton said the campground sustained extensive damage. Midge Wannamaker, who lives on East Animas Road, said a “torrential downpour” moved through the area that lasted 15 to 20 minutes. “You just knew it was going to do some damage because it was that heavy,” she said. After it passed, she looked outside to see water pouring across her neighbors’ yards. Mud and debris covered East Animas Road – so much so that she wasn’t able to distinguish the road from the surrounding landscape. “You can’t tell where the road is,” she said. John and Fran Reynolds said mud and debris washed across their property on the west side of Highway 550 near the intersection of County Road 250. They were surprised at how quickly the floods arrived after the rain started falling about 5 p.m.
La Plata County opened a call center for residents to obtain more information about flooding and potential evacuations. The number is 385-8700. 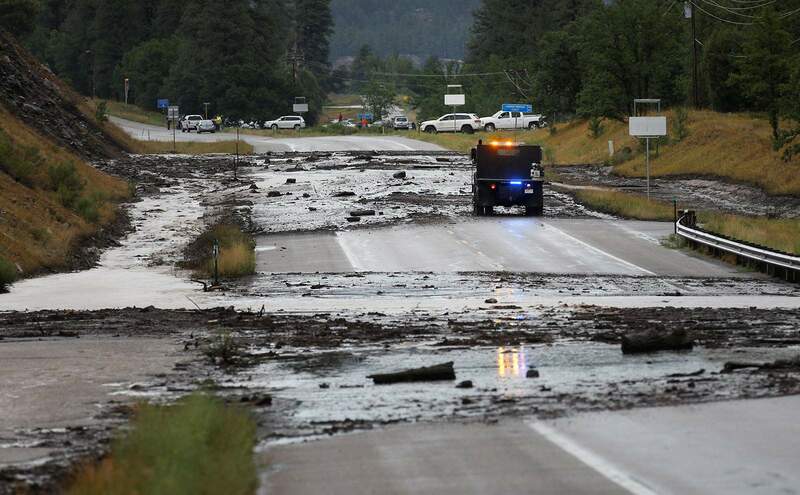 Flooding also occurred 10 miles west of Pagosa Springs, and U.S. Highway 160 was closed in both directions as a result of significant mudslides, according to the Colorado Department of Transportation. The highway was closed from about 4:45 to 8:30 p.m.
CDOT’s website on Wednesday stated westbound traffic on Wolf Creek Pass, between milemarkers 157 and 185, was restricted to loads no wider than 10 feet. This story has been updated to correct the direction of Wolf Creek Pass from Pagosa Springs. It is east of Pagosa Springs. Mudslides and flooding Mudslides after heaving rain Tuesday night covered portions of County Road 250 and U.S. Highway 550 north of Durango as well as train tracks used by the Durango & Silverton Narrow Gauge Railroad. Mudslides after heaving rain Tuesday night covered portions of County Road 250 and U.S. Highway 550 north of Durango as well as train tracks used by the Durango & Silverton Narrow Gauge Railroad. 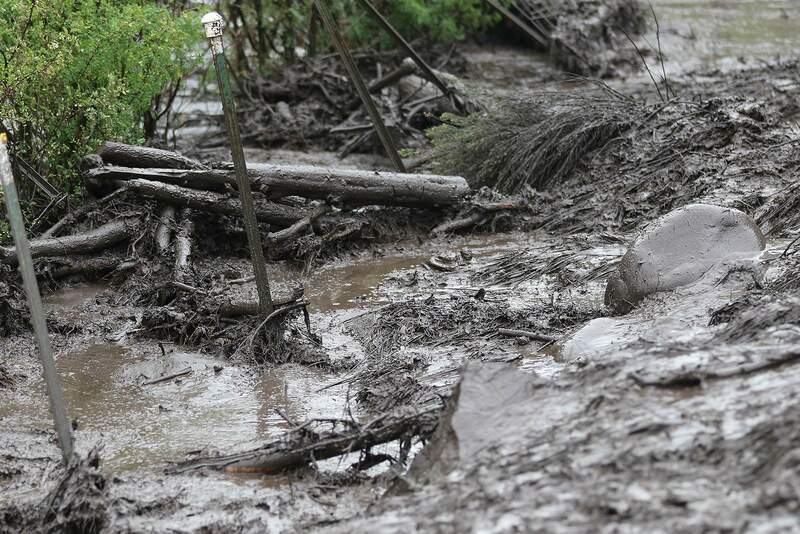 Mud covers the area near the KOA Campground on County Road 250 in Hermosa on Tuesday night. Heavy rains in the 416 Fire burn area triggered the mudslides. Mud covers the part of U.S. Highway 550 near the KOA Campground in Hermosa on Tuesday night. The mudslides caused the closure of the highway for part of the evening. Heavy rains in the 416 Fire burn area triggered the mudslides. Mud, rock and debris covered U.S. Highway 550, the railroad tracks and parts of East Animas Road (County Road 250) north of Durango. Heavy rains in the 416 Fire burn area triggered the mudslides. A mudslide covers the Durango & Silverton Narrow Gauge Railroad train tracks after heavy rains Tuesday night. The mud has forced the train to cancel service today, Wednesday. Heavy rains in the 416 Fire burn area triggered the mudslides. Large chunks of debris float in the Animas River near The Ranch in Hermosa on Tuesday night after heavy rains caused flooding and mudslides in the Animas Valley. Heavy rains in the 416 Fire burn area triggered the mudslides. Mike Cochran and his dog, Kirra, pluck large chunks of debris and trash from the Animas River near The Ranch in Hermosa on Tuesday night after heavy rains caused flooding and mudslides in the Animas Valley. Olivia Cochran said the couple planned to fish the river Tuesday night but when they arrived, they found the river a mess. Heavy rains in the 416 Fire burn area triggered the mudslides. Large chunks of debris and trash float in the Animas River near The Ranch in Hermosa on Tuesday night after heavy rains caused flooding and mudslides in the Animas Valley. Heavy rains in the 416 Fire burn area triggered the mudslides. 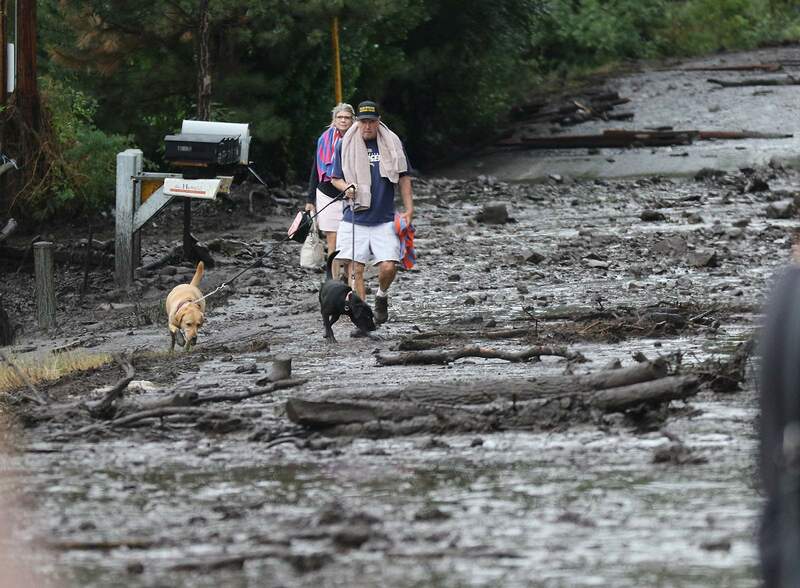 Bill Elkins and Karen White walk their dogs Goldie and Riley out of the KOA Campground where rains caused flooding on East Animas Road (County Road 250) north of Durango on Tuesday. A La Plata County Sheriff’s Office vehicle drives through mud and rock to help evacuate people Tuesday after mud flows closed U.S. Highway 550 north of Durango. Debris and boulders washed onto East Animas Road (County Road 250) on Tuesday night after heavy rains in the area.